Grammy Award-winning Californian icons, Deftones, today announce they will return to Australia for national headline shows this November. The tour will kick off in Perth on Tuesday 8th November, then hit Adelaide, Melbourne, Sydney, wrapping up in Brisbane on Sunday 13th November. Deftones snared their first ever Australian No.1 album with Gore last month, and are currently in the midst of a massive world tour. Gore is the result of a band that’s always been one step ahead of their alternative metal peers. They have spent their career battling on the front-line, always pushing ahead stylistically and crafting crushingly effective metal tracks whilst breaking new ground. Selling out most of their own national headline dates in a matter of hours just last week, Karnivool are confirmed to hit the road with Deftones. 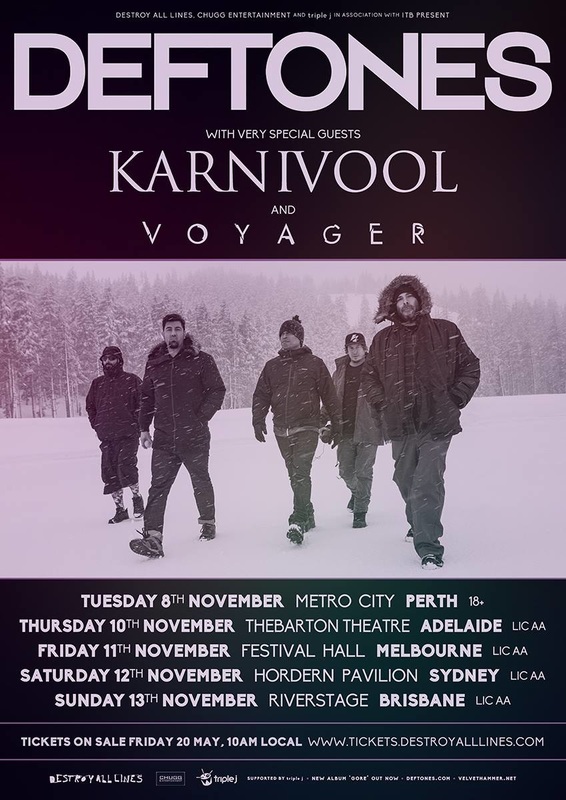 With their fourth studio album imminent, Karnivool will embark on their first support slot in over ten years, unleashing their innovative live show on music lovers around the country. Don’t miss this one-off opportunity to catch Deftones joined by some of Australia’s finest, Karnivool and Voyager, later this year.